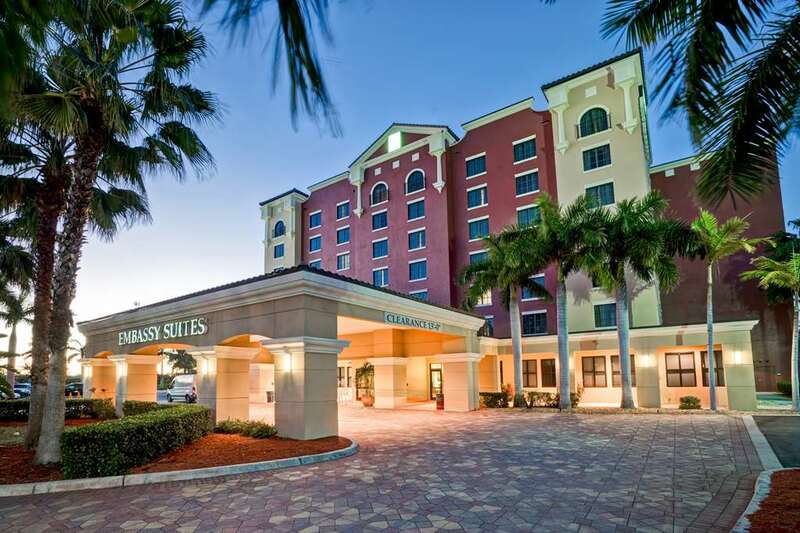 THIS HOTEL IS 100PCT NONSMOKING Make your next visit to paradise a **suite** one at the Embassy Suites Hotel Fort Myers. Fort Myers* only upscale all suites full-service hotel located just minutes from Southwest Florida International Airport. We are conveniently located near Florida Gulf Coast University Germain Arena Miromar Outlets International Design Center Coca Cola Chicos Cleveland Clinic Fort Myers Beach Bonita Springs Bonita Beach Park and Little Hickory Island Beach and Naples. All 150 *true two room suites** overlook our beautifully decorated garden atrium complete with waterfall. Included in each suite is a living room and separate bedroom mini-refrigerator microwave coffeemaker two television two telephones voice messaging and data ports iron and ironing board. We also offer complimentary High Speed Wireless Internet throughout the hotel. Each morning a complimentary cooked-to-order breakfast is served and each evening a complimentary manager*s reception is offered featuring beer wine mixed drinks and snacks. Enjoy our swimming pool and whirlpool spa that overlooks more than sixteen acres of pristine wildlife preserve. With over 4 000 square feet of flexible meeting/banquet space the hotel is able to host functions for up to 400. On-site full service restaurant and cocktail lounge. Additional restaurants adjacent. Earn Hilton HHonors Points and Miles while enjoying the best that Southwest Florida has to offer.